In 2008, while on my bike, I was unlucky enough to get hit by a car running a stop sign down the street from my house. Sadly, it’s pretty typical in such a congested area that was built when people were more worried about being run over by horse carriages careening down the street at a then-godforsaken seven miles an hour. Some notable things changed for me of course, but to be honest, the ultimate result of learning to cope with the lasting effects of being hit by a car has been to lend me a much better sense of humor about coping in general. Most of the time it’s pretty instinctive; when you think about it, we’re all coping, all broken in our own ways. Duh. If we all knew that we were seeing everything the same way, what would be the point? I may not really remember what some things taste like, I get particular smells stuck in my sinuses for weeks on end (please, Jesus, let it be nutmeg again this time and not city bus B.O. ), and I don’t hear much outside the range of low frequencies in my left ear, but in all honesty, I could hardly care less. Did you know Brian Wilson was partially deaf? Anyway, the point is this: there may have been a time when I was very concerned with experiencing music correctly, but these days, in the wake of learning to hear things again in my own fashion, I can hardly think of something more preposterous. Are we really trying to tell ourselves that everyone isn’t hearing everything a little differently? Certainly, there is enough consensus to go on for the sake of crafting some temporary standards of audio quality, but to be realistic, they should be viewed as the momentarily useful appraisals of technical precision they are—and really, most music that prescribes to those fleeting laws of “true listening” just isn’t very interesting. All this to explain why I enjoy music like that made by Celer’s Will Long so much: the idea that there is an objectively ideal way to hear something is about as silly as saying there is a simple definition for a good painting. And given the fact that the promotional material for Celer’s recent I, Anatomy LP includes the phrase “[the record] isn’t a story, it’s a hundred stories,” I think it’s safe to assume that Long understands where I’m coming from. I, Anatomy reminds me that incidentals and eccentricities are simply inherent to the listening process. No one will ever hear even the most well-produced record the same way twice if only for the dynamics of earwax, so why even attempt to embody the possibility? You know someone is just gonna upload all of your records to sendspace at 92kbps and spam the whole world, and it’s a bummer that you can’t control how everyone hears your music every time, so why not open the process up to those incidentals, magnify them in a sort of intentional overload? As a whole, I Anatomy is characterized by elusive, dense layers of sound and self-obscuring composites that create a sort of pleasurable lack of being able to discern individual elements. The effect is a common one in my experience of intriguing ambient music, which is what I’ll call Celer’s brand: always questioning the “truth” of the sound at hand. I love that it forces me to constantly ask if what I’m hearing really is what I’m hearing. Celer’s brand is almost too idiosyncratic to be open to interpretation, as the band’s history (which now finds Long based out of Tokyo) has been subsumed almost fully by somewhere around thirty hand-made, self-released pieces, as well as a personal tragedy that left Celer as a solo act. Yet, it’s almost impossible at any point in I, Anatomy to separate the soundscape into any constituent parts, into any specific emotions, which, while not being exactly groundbreaking for this genre, is made a very interesting focus in execution. What we hear is not necessarily a discernible “collection” of distinct sounds so much as the barely visible, vaporous apparitions that flash and hum in the midst of the foggy intersection of so many colliding atmospheres, like the mysterious ring that echoes from inside your head in the midst of too many thrumming appliances. Celer posits that mysterious ring as a sort of instinctive harmony, an opportunity as presented by the endless variation of individual biology to experiment with the possibilities of individualized experience—and those moments of mysterious, transcendent resonance are many. When we start to think about how unique each person’s internal soundsystem may actually be, we start to truly explore the sonic possibilities of this kind of strategically dense ambient composition. That obsession with the mechanics of interpretation, and that desire to push music past the realm of strict objective listening standards, are the things that have always excited me about music like this. It may be a bit of an obvious statement about ambient music to say that it’s particularly well-equipped to address these chameleonic aspects of sound, but the ways in which it stands out on I, Anatomy make it worth mentioning. Thanks to these qualities in particular, I, Anatomy maintains a sort of irresistibly intense gravitational pull. There always seems to be some barely-there sound haunting the furthest edges of the oscillating landscapes, plumes of ghostly electrical voices rising and fading before you can really get a hold on them. And it’s that feeling, of being drawn into a vibrating sonic black hole—ever deeper into what first appears to be a simple two-dimensional space but on closer inspection begins to pull the ear ever further in toward it’s crushing center—that buoys the record’s unassuming victories. The search for those mysterious undertones becomes an immersive, even hypnotic experience, and gives I, Anatomy a subtle depth that’s sure to keep a listener happily questioning what might be the next time through. Tracks roll like charged molasses, from ringing, ELEH-style minimalist tundras to bursting walls of treated Hecker-esque strings, but never seem to leave behind that coy invitation to go with the flow, to make something positive out of an irrational fear of tinnitus. That coping, after all, is only natural. Of course, I’m sure a lot of effort went into recording I, Anatomy clearly and to the best technical efforts of those involved. But what really hits home in the end is that the idea of hearing something specifically crafted for rigid, repeatable, reliable clarity doesn’t seem like the point. It’s almost as if Long would be very pleased to discover that your friend heard something completely different when you played his record for them. If two composers sat down to reproduce tunes from the record by ear alone, I think the difference in their arrangements and harmonies would be effectively astonishing. I’m reminded more than a little of Ryoji Ikeda’s landmark LP +/- (1996), which of all the records I can think of that display this quality, probably does it most directly and succinctly. Ikeda’s masterpiece was presented to me as an environmentally adaptive listening experience, or one that would shift and change based on my position relative to the sound and the listening space, and it is still, to say the least, an ah…ear-opening experience in regards to exploring the incidental possibilities of sound. From that point on, I just had a much harder time accepting music that didn’t take those elusive qualities of sound to heart in some way. So I’ve got to thank Mr. Long for validating me in a small way there. I no longer lament my inability to hear things the same way that someone else does, but rather enjoy making a point of celebrating my own unique cipher as much as possible. I, Anatomy might just do the same for you, too. The second vinyl presents two of the duo’s EP’s of 2007 and make an important heartfelt wish of Danielle and Will come true: they always wanted to couple both works on one album, but since they were then released on different labels, this endeavor proved to be impossible afterwards. Fulfilling Baquet-Long’s wish posthumously, side A features the EP called All At Once Is What Eternity Is, whereas side B is solely reserved for The Die That’s Caste. It is here that I, Anatomy changes its narratological style, as the two EP’s do not present a string of multiple events; if they do, it is realized in an implicit manner via the mode of action of the sound layers, not the titles themselves. All At Once Is What Eternity Is, originally released on the French Taâlem label, opens its almost 23 minutes in medias res, with a moon-lit swamp atmosphere thanks to its cricket-like chimes, whispering vesicles and intense synth washes that are occasionally slightly cacophonous and even portentous, but always find their way back to more auroral airflows. It becomes clear right from the get-go that the intermixture of the synth strings and drones is not as epicurean. Gossamer acroamatic undertones of tension are carefully interwoven, potentially counteracting against a too bright incandescence, always looming and reaching their peak the same time the wave-like climax does. After the inclusion of a few field recordings of pops and crackles, the synths come back to full force, now a bit more limewashed and blurry. Once another field recording of gentle ocean waves is admixed, the scenery brightens up with the drone layers reciprocating ecstatic warmth and cavernous insinuations in equipollent parts, resulting in a whale song-like structure embedded in-between an orchestra string arrangement analogical to John Adams. The complexity of this EP does not kill the accessibility to this tune, but it becomes apparent that the vivacious colorscapes of the first vinyl disc are now neglected for a scheme that is nurtured by potentially conflicting keys. Danielle Baquet-Long’s and Will Long’s audio diary called I, Anatomy has finally been realized in a beautiful form and with great style. Since Will is still curating the unreleased material he has co-written with Danielle, the enablement of such luxurious and limited releases does not solely depend on the respective label anymore, but the curative skills and the ability to weave a bearing around the presented material. As I have stated in this review, the concept of depicting a few incidents that do not have much in common other than the fact that all of them are heartwarming and precious, is a straightforward and honest one. And the music entrances the listener and does not only live up to the modest implications set by Celer, but exceeds the unveiled prospects by a wide margin. The first two tracks are tremendously vivid and varied, with field recordings following after lush drone thickets. I cannot help myself but to note the Rave-related structure: naturally, one won’t hear pitched voices or eclectic Jungle snare drums in a Celer tune, but the synths themselves sound so vibrant, fresh and crunchy that they would in a weirdly twisted way resemble the late 80’s and early 90’s halcyon days and the second Summer of Love in Britain if they were sped up. This is Drone music of the heart, and yet it gleams and shines in technicolor. The second vinyl disc couples the two important 2007 EP’s, and it is here that the mood is getting more doleful without ever being soul-crushing or crestfallen. All At Once Is What Eternity Is provides a specifically detailed glance onto the counteracting, ambiguous setup of opposite moods and strings, as the duo of Celer skillfully mediates between them and brews a brightly-lit result, whereas The Die That’s Caste offers a stringent take on hibernal synthscapes with piercing sine waves and a crystalline mist, making it the most contemplative and profound composition whose implied colors stand in a contrastive relation to Christoph Heemann’s LP artwork. I, Anatomy is as ever-changing and fluctuant as the delineated memories one has in mind, but can never grab them in deeper clarity. The strongly positive vibe on the majority of the offered material is the album’s biggest boon, followed by the saturated textures and the variety. 幽玄なドローン、日本庭園のような落ち着きを見せる静かな持続、ドラマチックなオーケストラ演奏や物思いに耽る美麗なものなどなど、多様な作風の楽曲を収 録。更に2枚目には仏talesから発表していたAll At Once Is What Eternity Isと、西CONVから発表していたThe Die That’s Casteの2枚のEPがまるごと入っています! アートワークはあのChristoph Heemannが担当。LPということもあって、いつもよりも立体感に満ちたCeler節を聴く事が出来ます。お勧めです!!!!! It must be ace being a fan of Celer. You get a new record pretty much every day. I should be a fan of theirs, instead I obsess about bands like The Blue Nile, Scritti Politti and Prefab Sprout who, if you are lucky, manage to squeeze out one album per decade. Anyway for those aching for a new Celer album here it is. Well it’s not ‘new’ as such, actually, I lie – a lot of it is, I think. It says recorded 2005-2009 so presumably it’s gathered-together material. The final two sides each consist of previously released CDrs – one on Taalem records and one on Con-V. The good news is that it’s just like all the others, gorgeous waves of melancholic sound using just simple synths. Nothing to it really, hardly an overdub in sight just a pleasant synth or two churning around for the best part of an hour. It has to be said, though, it’s evocative soothing stuff that has the ability to take you far, far away from the mundanity and stress of everyday life. 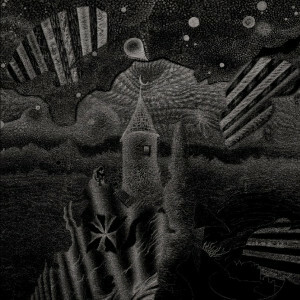 This 2-LP edition, its cover graced by Christoph Heemann’s proverbially masterful artwork, features previously unheard materials and the reissue of two preceding shorter works, meant to belong in the same sentence as they do now: All At Once Is What Eternity Is and The Die That’s Caste, originally published by Taâlem and Con-v respectively. I, Anatomy deals – as the large part of Will and Dani Long’s output does – with reminiscence, in a form or another. Snippets of actual conversation, brief extracts from movies and field recordings are interspersed to instrumental excerpts that mostly use ebbing and flowing cycles to conjure up impressions of solitude similar to the ones experienced when one feels misunderstood and unsought, typically by the object of a hopeless love. Halfway through a William Basinski/Keith Berry hybrid and the finest typology of modern ambient, most of these acoustically concordant caresses hide strange species of resonance under the evident quietude: listen carefully and you’ll notice unusual suspensions of frequencies lingering amidst the poignancy of the ad infinitum looping sections. The reissued tracks connect us to analogous psychological spheres, mainly linked to the awareness of human limitations. The climate may occasionally result a little ominous, especially in TDTC, whose meshing of subsonic elements and superimpositions of blurred tones acts as balancing constituent against the scarce motility. The desirable volume for the entirety of this release should remain in the medium-to-low range, for the sounds generated by Celer possess that modicum of self-shaping inscrutability which does not require anything but silence and inner predisposition to cut through our explorations of the soul with blade-in-butter effectiveness. È probabile che chi ha rinunciato ad accostarsi alle decine di uscite a nome Celer, con lo spirito da autentico esploratore che l’enorme mole di musica prodotta da Will Thomas Long richiede, ritenga troppo immediato – se non addirittura troppo agevole – il suo processo produttivo, per non parlare delle frequenti riconsiderazioni e riedizioni di dischi passati. Invece, basta accettare la fuggevolezza delle sensazioni messe in musica da Long e l’endemica nostalgia che avviluppa le sue composizioni per comprendere un’operazione come quella di “I, Anatomy”, doppio vinile che ripropone nella forma unitaria nella quale erano stati originariamente concepiti i due Ep del 2007 “All At Once Is What Eternity Is” e “The Die That’s Caste”. Così radunate ed espanse attraverso nuovi frammenti compositivi, quelle afasiche narrazioni distanti un lustro assumono nuova forma e significato, cristallizzandone la memoria anche al di là della loro ora e un quarto di durata totale. Come quasi sempre avviene con le opere di Celer , “I, Anatomy” è un’immersione riflessiva nella solennità di un suono puro, capace di innalzarsi luminoso nelle impalpabili correnti ambientali della prima pièce così come di scandagliare sorde profondità in quelli successivi. In particolare, l’ipnotica meditazione evocata nei quasi ventitre minuti di “All At Once Is What Eternity Is” riassume il senso di un’operazione comunque destinata a restare appannaggio di pochi estimatori, anche per la consueta limitatezza dell’edizione.